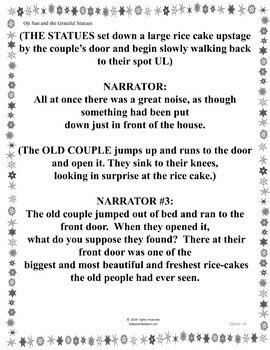 This charming play created for the creative dramatics class level shares the themes of multiculturalism, winter, kindness and forgiveness. 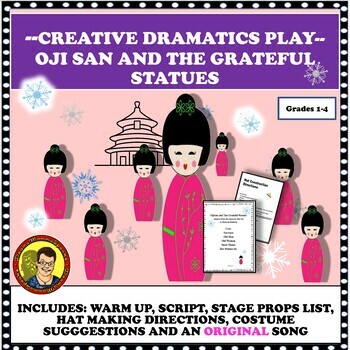 It is excellent for cooperative learning, studies of other cultures, and very suitable for a Vocal Music, Social Studies class as well as a Drama. •	and use their imaginations to express emotion through movement. Integrate with your vocal music teacher and present the play together! Your students can sing and accompany the song with metallophones, xyllophones and percussion. 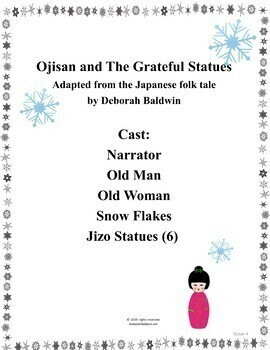 Ojisan and the Grateful Statues is a guaranteed winner. "This is such an original and creative drama unit. It is extremely thorough and has everything I need. I think you covered all the bases. Excellent resource, I highly recommend." "I love the challenges included in this resource and what it does to storytelling. I can't wait to try them with my students! Thank you!" An absolutely comprehensive package that is easy to implement- what a time saver! A creative way of encouraging students to learn about stage properties, view video examples, take notes, and simply be creative! Looking forward to using this!